Yesterday was a good day. The Yankees won and the Athletics lost, which knocked the magic number for homefield advantage in the Wild Card Game down to two. Could clinch tonight! The Yankees need to Mariners to cooperate for that to happen though. Either way, we’re locked into a Yankees vs. A’s Wild Card Game now. It is official. It is hot and sticky and rainy in St. Petersburg today. Sometimes the dome comes in handy. Tonight’s game will begin 7:10pm ET and you can watch on YES. Enjoy the game. Injury Updates: Didi Gregorius (wrist) saw the doctor today and was given the okay to resume baseball activities. Hooray for that. Gregorius hit in the cage and remains day-to-day. The hope is he can return to the lineup this weekend … Aaron Hicks (hamstring) ran on the treadmill and hit in the cage today. He expects to return to the lineup Friday … Gleyber Torres (groin/hip) is good to go and available today. Aaron Boone is giving him the proverbial one extra day to rest up. There are five days to go in the regular season and, at some point in the next seven days, the various voting members of the BBWAA will have to submit their ballots for the major awards. Ballots are submitted after the regular season but before the postseason. MVP and Cy Young and all that are regular season awards. The postseason is not a factor. In recent years the voting body has done a better job handing out the awards, and by that I mean the voting results have aligned closely with my hypothetical ballot. The Yankees have several awards candidates this year — not as many as last year, but definitely a few — and could have someone walk away with some hardware. Let’s break down the awards races with only a handful of regular season games remaining. Aaron Judge’s wrist injury removed him from the MVP conversation. It wouldn’t surprise me to see him get some eighth or ninth or tenth place votes, but, as far as being a true MVP candidate, missing two months put an end to that. The AL MVP award will likely go to Mookie Betts, Mike Trout, Jose Ramirez, Alex Bregman, or J.D. Martinez. Khris Davis and Matt Chapman will get some love as well. Those are the top MVP candidates at the moment. With Judge out of he mix, the Yankees don’t have a bona fide MVP candidate, which is kinda weird for a team with a chance to win 100+ games. Giancarlo Stanton’s had a good but not great year, Didi Gregorius had a brutal May and has missed time with injuries, Aaron Hicks doesn’t seem high-profile enough, and Luis Severino slumped terribly in the second half. Miguel Andujar or Gleyber Torres? I bet they get some down ballot votes., especially Andujar. Unlike last season, when Judge was right there with Jose Altuve, the Yankees don’t have a legitimate MVP candidate this year. They might not even have anyone finish in the top ten of the voting. The last time that happened was 2016. 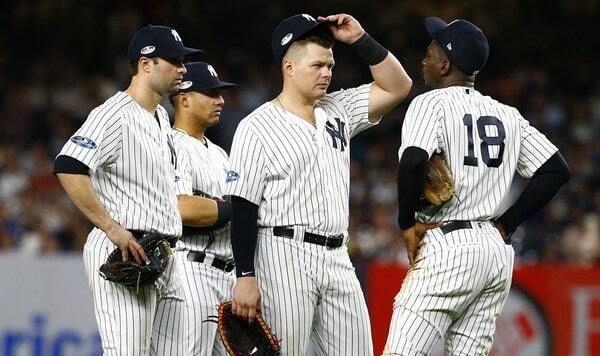 The last time it happened in a year the Yankees made the postseason was … 2015. I would’ve guessed the last time that happened was much further back. Apparently not. The second half skid doomed Severino’s Cy Young chances. Others like Blake Snell, Chris Sale, Corey Kluber, Justin Verlander, and Gerrit Cole have been so good that Severino might not even get a fifth place vote. (The Cy Young ballot runs five names deep.) Lame, but when you pitch as poorly as Severino did for as long as Severino did, you can’t expect Cy Young votes. Aside from Severino, I think the only pitcher on the staff with a chance to get a Cy Young vote is Dellin Betances. Masahiro Tanaka labored in the first half, Aroldis Chapman has been hurt and ineffective in the second half, and David Robertson hasn’t had a “reliever who deserves Cy Young attention” season. Betances might’ve. He has received Cy Young votes before — one fifth place vote in 2015, to be precise — and it could happen again. I’d bet against it. Decent chance the Yankees are completely shut out of the Cy Young voting this year. Now we’re talking. The Yankees had the Rookie of the Year runner-up two years ago (Gary Sanchez) and the unanimous Rookie of the Year last year (Judge). They could have the Rookie of the Year winner and runner-up this year thanks to Miguel Andujar and Gleyber Torres. The last team with the first and second place finishers in the Rookie of the Year voting is the 2011 Braves with Craig Kimbrel and Freddie Freeman. The last AL team to do it is the 1984 Mariners with Alvin Davis and Mark Langston. Wendle ain’t winning Rookie of the Year. You have a few weeks to prepare yourself to be angry when Wendle gets a handful of third place votes instead of Andujar or Gleyber, but he’s not winning. Fair or not, there is a narrative component to these awards, and Wendle has zero narrative going for him. He’s a 28-year-old rookie who was designated for assignment over the winter and is getting a WAR boost because the defensive stats still don’t handle multi-position guys well. There is no shame in finishing behind Ohtani. The Yankees will be the first AL team with two top three finishers in the Rookie of the Year voting since the 2013 Rays (Wil Myers and Chris Archer). Last season only four AL managers received Manager of the Year votes. Two years ago it was six. The year before that it was seven and the year before that it was seven as well. Nearly half the league! This year the Manager of the Year award figures to go one of three managers: Kevin Cash, Alex Cora, or Bob Melvin. The Red Sox are having a historic year and that’ll undoubtedly get Cora votes. The A’s are a surprise contender and that usually equals Manager of the Year votes. The same applies to the Rays and Cash. As for Aaron Boone, everyone expected the Yankees to be good this season and the Yankees have been good this season, if not underwhelming in the second half. A team expected to be good having a good year — and not a historically great year like the Red Sox — usually doesn’t earn a skipper many Manager of the Year votes. There are 30 Manager of the Year ballots and three spots per ballot. How many of those 90 spots go to Boone? Three or four, tops? I’m not sure he even gets that many. The last Yankees manager to win Manager of the Year was Joe Torre in 1998. That won’t change this year. The Yankees don’t have a Comeback Player of the Year candidate. This usually goes to a guy who missed most (or all) of the previous season with an injury and the Yankees don’t have anyone like that. Maybe Betances would get some Comeback Player of the Year attention? I doubt it. As bad as he was down the stretch last year, he had a 2.64 ERA (3.23 FIP) and was an All-Star last season. My guess is Matt Duffy will be named Comeback Player of the Year considering he’s hitting .294/.360/.366 (106 wRC+) at the moment and played 91 total games from 2016-17 (zero in 2017) due to an Achilles injury. 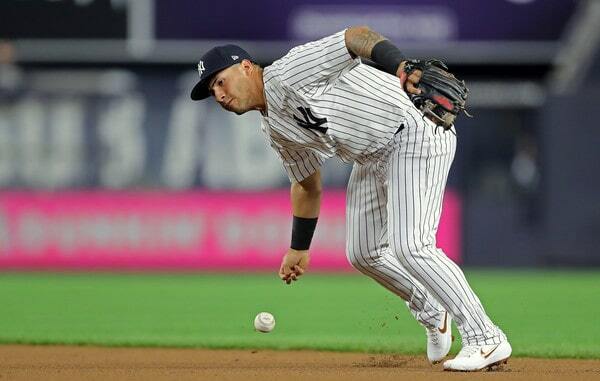 The Gold Glove selection process has improved in recent years — there’s a statistical component now and there doesn’t seem to be as much reliance on reputation — and I’m not sure the Yankees have a Gold Glove candidate. Judge missed too much time and he wouldn’t beat out Betts anyway. Hicks is a good defensive center fielder but also probably no better than the fourth best defensive center fielder in his own division. Gregorius has to contend with Andrelton Simmons and Francisco Lindor. Gardner? Meh. The Yankees’ best hope for a Gold Glove is probably Tanaka. He’s an excellent fielder. But yeah, bot seeing a Gold Glove in the 2018 Yankees’ future. As far as the Yankees are concerned, all the intrigue this award season will revolve around Rookie of the Year. They don’t have a serious MVP or Cy Young candidate, but Andujar and Torres are right in the Rookie of the Year mix. Beating out Ohtani won’t be easy. Maybe even impossible! But I do expect those two to finish in the top three of the voting somewhere. Three straight seasons with top Rookie of the Year candidates is pretty cool. Hopefully Justus Sheffield makes it four straight next year. Good win last night. The Yankees beat the Rays at their own game with the bullpen and knocked them out of postseason contention in the process. That was satisfying. That doesn’t mean the Rays will lay down these next three days, of course. It doesn’t work like that. They still want to win and make life miserable for the Yankees. The magic number for homefield advantage in the Wild Card Game is four. It is it hot, humid, and rainy in St. Petersburg today. Good day to play indoors. Tonight’s game will begin at 7:10pm ET and you can watch on YES locally and ESPN out-of-market. Enjoy the ballgame. 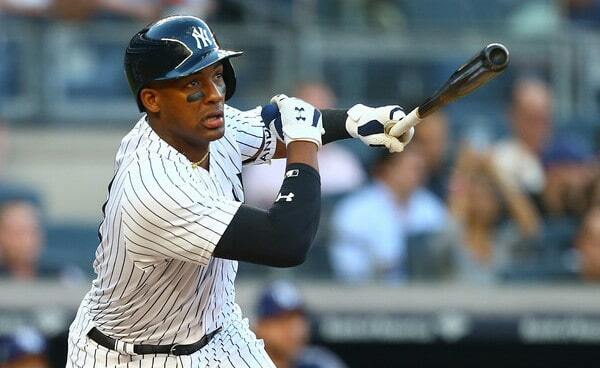 Injury Updates: Aaron Hicks (hamstring) went for an MRI today and it brought back good news. There’s no tear. The hamstring is still tight and Hicks is day-to-day. Best case scenario, basically. “We feel like we dodged a bullet,” said Aaron Boone … Didi Gregorius (wrist) took ground balls today without throwing. He is still receiving treatment and said he feels better than he did yesterday, when he felt better than he did Sunday. Gregorius will see the doctor for a check-up tomorrow … Gleyber Torres was scratched from tonight’s lineup with tightness in his groin/hip. He spent a few weeks on the disabled list with a hip problem earlier this year, remember. Torres was scratched as a precaution and is available off the bench. The Yankees and Orioles continue their three-game series later this afternoon, with the penultimate regular season game at Yankee Stadium this year. That’s a 4pm ET start. Remember when they played baseball at 1pm ET on Saturdays? Those were the days. Anyway, here are some notes to check out. According to Jon Heyman, the Yankees were one of five teams the Mets focused on during Jacob deGrom trade talks at the deadline, though they weren’t doing a deal without getting top young players in return. That presumably means Gleyber Torres. The Mets also discussed deGrom with the Blue Jays, Braves, Brewers, and Padres, and Heyman indicates they wanted Vladimir Guerrero Jr. from Toronto and Fernando Tatis Jr. from San Diego. So yeah, the best of the best prospects. deGrom has been the best pitcher in baseball this season and he’s under team control another two years, so the Mets were absolutely correct in demanding tippy top prospects. Not asking for Gleyber would’ve been negligent. I love Miguel Andujar, he’s the man, but I wouldn’t trade deGrom for a package fronted by Andujar. I’d need a better centerpiece and that’s Torres. If the Mets don’t contend next year, the asking price on deGrom could come down because he’ll have less control remaining and also because he probably won’t be this good again. That said, the Yanks-Mets blockbuster trade hurdle still exits. As I’ve been saying, I need to see these two teams make a trade of this caliber to believe it. File this under “it’s probably not going to happen,” but Aaron Boone did leave the door open for Justus Sheffield to make the postseason roster. “You never know how the next couple weeks unfold. I’m mindful of this time that a lot changes day to day, every couple of days, week to week, depending on need, depending on performance, depending on how guys are looking,” said Boone to Brendan Kuty earlier this week when asked about the possibility. Sheffield, 22, made his MLB debut the other night and it wasn’t pretty, but he did throw a scoreless inning in a blowout win. There are nine regular season games remaining and I don’t see how Sheffield could do enough to make the postseason roster, even as an extra lefty. Six bullpen spots are already accounted for (Aroldis Chapman, Dellin Betances, Zach Britton, Chad Green, David Robertson, Jonathan Holder) plus I assume Lance Lynn will be in the postseason bullpen as well. There doesn’t seem to be room for Sheffield, but hey, stranger things have happened. Starting next season, the two Triple-A leagues (International League and Pacific Coast League) will begin using baseballs made to Major League specifications, reports J.J. Cooper. Major League and minor league baseballs are made with different seams and a different cover, and the Major League ball tends to carry farther. That’s why many young players (e.g. Gleyber Torres) come up and hit for more power in the big leagues than they had in the minors. The switch next year will approximately double what Triple-A teams pay for baseballs throughout the season. It is kinda dumb MLB and minor league (and college) leagues use different baseballs, but it’s all about cost. Teams don’t want to spend more on baseballs than they have to, so inferior baseballs are used in the minors. At least now the Triple-A and MLB balls will be uniform. Offense will increase in Triple-A — the PCL league average was .270/.340/.423 this year and that’s only going to go up with the new ball, so that’s fun — thought at least it’ll be a little easier to put Triple-A statistics into context. I get the sense a lot of fringe MLB pitchers are in for a rude awakening in 2019.